The name Abayudaya in the Buganda language means the "People of Judah", analogous to Children of Israel. The Abayudaya people make no claim to be descended from any Jewish tribe, currently existent or lost, nor are they genetically or historically connected with ethnic Jews. Though lacking historic precedent, the tribe is devout in its Jewish practice. How did this come about? Buganda is a region and former kingdom in eastern Africa, on the northern shore of Lake Victoria. 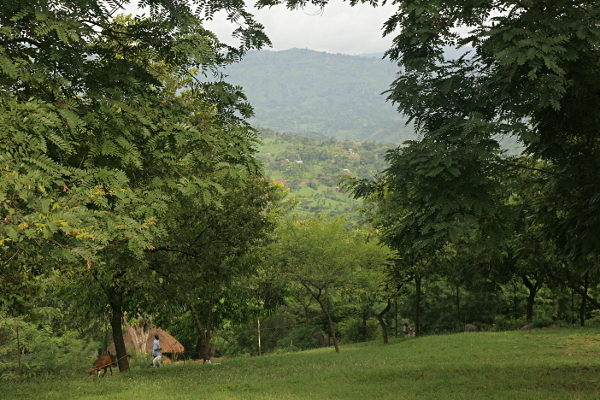 Today this area is part of Uganda, though it was a British protectorate from 1894 until 1962. One of the local leaders at that time was Semei Kakungulu. He was born in 1869 and was converted to Christianity by British missionaries. Today his descendants refer to him as the king of Bukedi, and his grave lists him, amongst other titles, as President of Busoga. I have not been able to ascertain his exact role in Gandan society, but it seems he garnered British support because he commanded a large number of warriors, had connections to the Bugandan court and was a Protestant. Kakungulu aided the British Crown in conquering large areas of territory, believing that in return for his services he would be appointed governor of the vanquished regions. When the British did not fulfil this perceived agreement, he distanced himself from them, building a house in the beautiful countryside of Gangama on the western slopes of Mount Elgon. In 1913, he became a Melkite Christian, following a practice that combined aspects of Christianity, Judaism and Christian Science. This move further distanced him from the British. "Thus says the Lord, 'Keep justice and do righteousness, for My salvation is near, and My favour is to be revealed. Happy is the man that does this, and the son of man that holds fast by it; who keeps the sabbath, not profaning it, and keeps his hand from doing any evil.' Neither let the stranger, who has joined himself to the Lord, say, 'The LORD will surely separate me from His people' . . . ."
He was also critical of the missionaries themselves, claiming that they were misinterpreting the bible by keeping the sabbath on the wrong day of the week. He brought proofs from the new testament accounts of Jesus's death to prove that the day of rest was on Saturday. When informed by his Christian and Moslem neighbours that the Jews were the only people who accepted only the Torah part of the bible, he responded, "So I'm Jewish". He immediately circumcised himself as did his sons and they commenced observing the Shabbath as he understood it from the texts. Many people followed his actions and moved to live within his proximity. This took place, it seems, in 1917. We cannot be certain how he "kept the sabbath" with only the written Bible as a source. There are many other aspects of halacha that he could have only guessed at. For example the Torah tells us that Passover is celebrated annually in the "month of the spring". When is that? This is especially difficult when you are located in a region, on the equator, 1,300 metres above sea-level. There is no spring, the only two seasons being wet and dry. A short time later, in 1920, in what I consider akin to a visit from Elijah the prophet, a man known only as "Yosef" appears on the scene. The Abayudaya claim he came from Israel, but it is more likely that he was a European Jewish merchant passing through the region. Obviously fascinated by the phenomenon before him, he stayed for about six months, teaching the locals many aspects of Judaism including the workings of the Jewish calendar, festival customs, an introduction to kashruth and teaching them to read Hebrew. Kakungulu set up a "yeshiva" to teach his knowledge of Judaism to his people, combining religious instruction with political leadership. In 1922 he produced a guidebook of rules and prayers for his Jewish community. 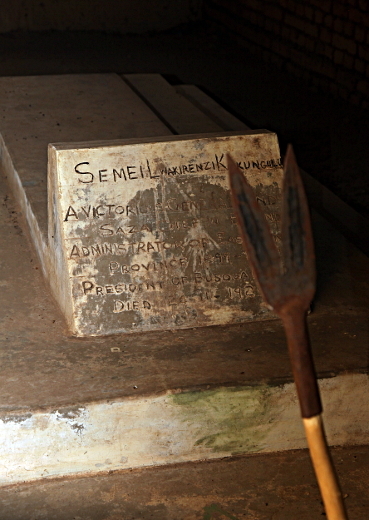 Semei Kakungulu died of tetanus in 1928. A division amongst his followers seems to have occured, with some wanting to include belief in Jesus into their core faith. The leadership role of those who remained faithful to Kakungulu's Judaism passed to Samsom Mugome. He introduced the custom of marriage only within the tribe. He ensured that his daughters, Deborah, Rachel, Naomi and Tamar married men within the tribe. Under his leadership new synagogues were opened in other villages. By the early sixties the tribe had grown to a population of about 3,000 members, living in a number of villages stretching the foothills of Mount Elgon. It seems that under Samsom's leadership members of the tribe started to adopt biblical names. Today they all have biblical names. In the early sixties Samsom made contact with the Israeli embassy in Kampala, in the hope that some of the members of the tribe would be sent to Israel to study the Torah in depth. This does not seem to have led anywhere. Tragedy hit the tribe with the accession of Idi Amin to power in 1971. His eight year rule decimated the Abayudaya, his human rights abuses leaving open wounds in Uganda until today. 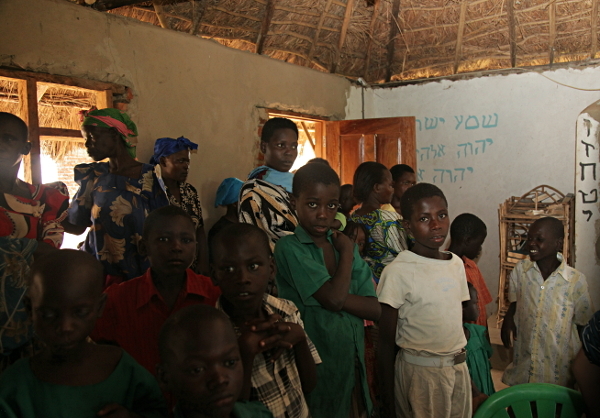 Viewing the tribe as the Jews of Uganda, Amin introduced harsh decrees against any religious practice that was construed even similar to Judaism. He closed all the synagogues, banning outright Jewish prayer. Even the possession of texts written in Hebrew or about Judaism were deemed illegal. Many members of the tribe were forcibly converted to Islam or Christianity to avoid being killed. Those who did continue to pray and practice as Jews did so at great personal risk, in absolute secret. They would go out at night into fields, populated by dangerous wild animals, or into dark caves and other secret locations. By 1979, the end of the Amin era, only about 300 remained faithful to their Judaism. Though Idi Dada was gone, it still took another ten years for Uganda to return to normal. The tribe started to regenerate, building on its youth for its future. Today the tribe numbers about 1,100 members. In the early 2000's, the American Conservative Movement of Judaism made contact with the tribe. One of the members of the tribe, Gershom Sizomu, was sent to the United States to study rabbinics. He spent five years there, returning with the title of rabbi, though not a great knowledge of Judaism. The Conservatives sent five "rabbis" to the region to convert the tribe to [Conservative] Judaism. This was an unfortunate turn of events, once again unnecessarily dividing the tribe. Some members protested that they had not remained faithful to Kakungulu's teachings for nearly 100 years in order to become not universally accepted Jews. 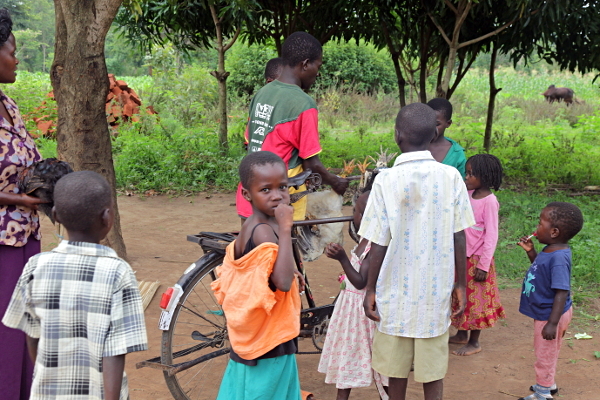 These people separated themselves from the remainder of the tribe, moving to a corner of the village of Putti where they have set themselves up as the She'erit Yisrael community, the "remnants of [Ugandan] Israelites". They practice Judaism as fully as they can, awaiting orthodox conversion. This division has cut across family lines, but fortunately, relations between the two factions have remained cordial. Interestingly, a putto [in Italian] is the representation of a small child, often portrayed innocently naked, heavily used in Renaissance art. Michaelangelo's Sistine Chapel fresco shows many of these figures dispersed amongst the various panels. The plural of putto is "putti". Enosh, one of the leaders of the Putti community, was waiting for us when we finally arrived at the Mount Elgon Hotel on the eastern outskirts of Mbale. He was keen to get moving. As we had arrived later than expected, we quickly unloaded our luggage and soon were back on the road, with the addition of Enosh in the car. The ride to Putti takes about twenty minutes, along roads whose condition only worsened further as we drove. We pass the Mbale clock tower, leaving the town in the opposite direction to which we had entered. Our road passes through mainly cornfields dotted with small villages of wigwams and mud bricks, past thin grazing cows. Everything is very green, extremely pastural. The only diversion on the scene was a multi-storied Moslem college just off the main road. 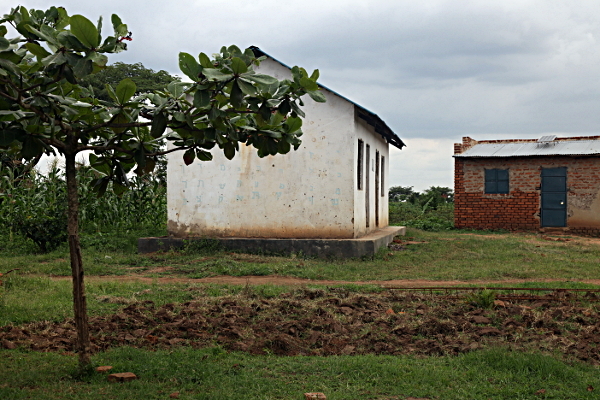 This the main campus of the Islamic University in Uganda. This region has been home to Moslems for longer than it has been Christian. Eventually we make a left turn off the "highway" onto a dirt road. A few bumpy miles later we reach Putti. The Putti Abayudaya live in a corner of the village which is dominated by Moslems and Christians. I quickly get out of the car to acclimatise. There is neither running water nor electricity here. 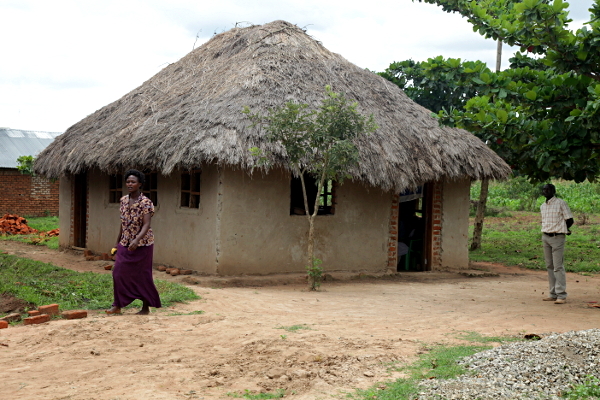 The houses, surrounding the synagogue, are generally constructed of locally produced mud bricks with corrugated iron or thatched rooves. There is no glass in any of the windows. The only semblance of modernity is that well water is now brought to the surface via a donated solar powered pump. Women -- it seems since biblical times this is one of the roles of village women in agricultural societies -- gather by the well to meet and chat, and more importantly, to fill their containers from the well 'tap' to carry back home, usually on their heads. Our arrival causes a buzz in the town. Everyone comes out to view the five honoured visitors from Israel. They decide we should all adjourn to the little central synagogue for mincha. This is a great honour, but at the same time presents us with a dilemma. We are the only five "real" Jews here -- I do not intend this to be a racial slur, but rather a halachic statement -- so in essence we do not have a kosher minyan. Our rabbi tries to grapple with the problem. "Ari, maybe you lead the davening." "How does that help", I protest. "He can't say kadish nor kedusha nor the repetition. We're here to see what they do, to observe their Jewishness. Let's ask them to send someone to lead the prayers and we'll just tag along." The rabbi asks the community, "Would one of you like to lead the services", at which point all eyes turn to Moshe, a bright eyed young man standing nearby. 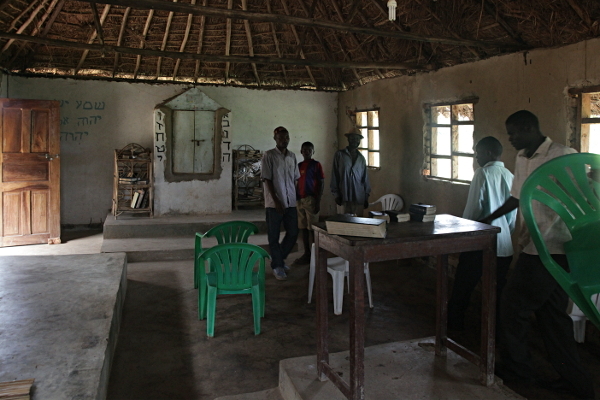 The synagogue is housed in a single-roomed, thatch roofed building. There is an entrance at the rear of the building, another on the left side, near the front. At the centre of the front wall is an aron kodesh with hand painted dark brown letters aleph to hey on right side of the cupboard double doors, vav to yod on the left. To the left of the aron kodesh the words of the verse shma yisrael are painted in bright blue. The left side of the room is slightly elevated. This is the women's section. Towards the back is another small elevated concrete slab on which sits a reader's table. A new, much large synagogue is under construction next door. Moshe dons a talith, ascending the little bima. Men, women and children all take their places in the sanctuary. Moshe opens by reciting the first verse of ashrei, in perfect Hebrew, in a slightly melancholy tone. The entire assembly enthusiastically respond with the following verse, ashrei ha'am sh'kakha lo. Moshe continues the next verse in a slight crescendo. I am euphoric. Something electrifying is in the air. Here I am, in the middle of deep dark Africa, not a white man in sight, the locals praying with such sincerity that embarrasses me when I think of home, when I think of other diasporas. I push thoughts out of my mind. I desire to savour the moment. The prayers continue, alternating between Moshe and the congregation crammed into the small synagogue. Moshe becomes more and more elated as we continue chanting the verses of the chapter together. Some of the people are holding prayer books, other seem to know the words by heart. We arrive at the amida, the silent prayer. The room falls absolutely noiseless. You could hear the drop of the proverbial pin. I was spiritually elswhere, deep in a slow long prayer. Eventually the prayers end with a resplendent rendition of aleinu, everyone together, out loud. At the end of this service I look at the rabbi. The rabbi looks at me. Our eyes meet. Then we start simultaneously, with the same words, "I've prayed in many places around the world, but I don't recall many times that I reached the spiritual level I just attained, here, deep in Africa". The community are keen to meet us, and for us to get to know them. 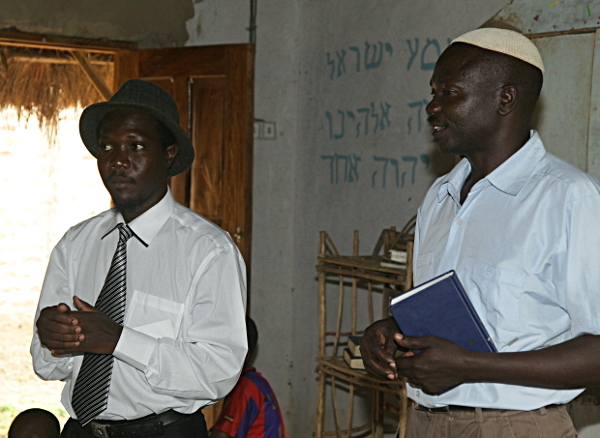 Enosh and his uncle, Uri, the main leaders of the community, come before the assembled congregation. Uri is a grandson of Samsom Mugome. They introduce us to the Abayudaya in general, and then to their key members. Translations are made for those who do not understand English. I'm not sure whether the vernacular here is Swahili or Luganda, but I believe they are similar languages, Swahili containing Arab language elements. The people's love of Judaism exudes in their words and in their voices, and in the eyes of all present, quietly listening to the presentation. They understand that the true manifestation of Judaism is in practice only in the land of Israel, something that many "real" Jews in our generation have yet to understand. They seek spiritual, not material, elevation. Semei Kakungulu's nephew, now 94 years old, is present. He narrates the history of the tribe including his uncle's and his father's involvement. He relates his experiences during the Amin persecutions, how he continued to practice his Judaism. Finally Rabbi Riskin addresses the tribe. They sit on every word, often applauding before hearing the translation. The rabbi praises their determination and their perseverance -- and their obvious sincerity. He promises to help them find a solution to their conversion problems. Then he calls upon young Moshe. He offers a flabbergasted young man a full scholarship to come to Israel to learn in his yeshiva. 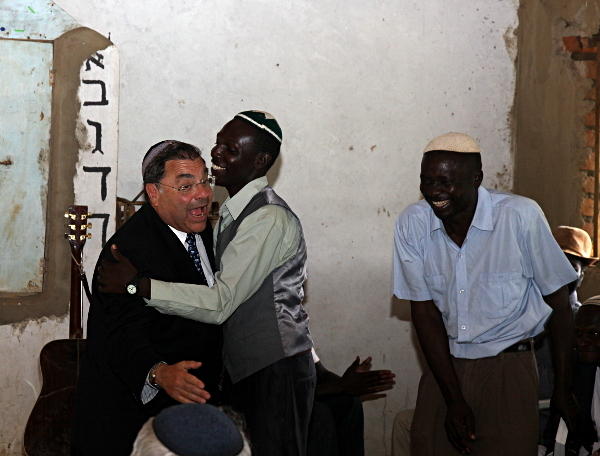 Moshe grabs the rabbi in a hug of elation, his smile reaching from ear to ear. All of Moshe's dreams have come true. Everyone present participates in Moshe's joy. 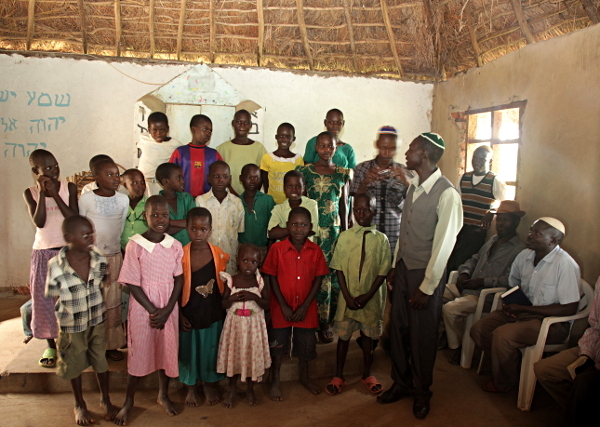 A choir of children sings a selection of their unique African-Jewish music. Some of the little boys dance unrestrainedly to the rhythm. I brought lollipops from Israel. I hand them out to the children after the performance. They're a big hit. We didn't look inside the aron kodesh, but I subsequently found out that it contains a paper Torah, the type children use on Simchat Torah. It was sent to them by a Yeshiva University student who visited about eight years ago and found them reading the Torah from photocopies. Just yesterday I read an article about a Dallas spinal surgeon who volunteers in Uganda, operating on needy children. Last year he made contact with the Putti people, spending shabbath in Putti. He "was saddened to see them take out the paper Torah", so he decided to procure a "real Torah" for them. Members of the Putti tribe generally do not eat meat, not because they are vegetarians by choice, but rather because they don't know the laws of Jewish ritual slaughter. Ari offers his services as a shochet. They are pleased by the offer, but regrettably inform us that they cannot afford to purchase chickens. They are subsistence farmers, eating what they grow, trading very little. We give them money to buy ten chickens, a feast in their world. After twenty minutes the chickens arrive -- tied in pairs by their legs, each couple slung over the handle bars of the delivery boy's bicycle. 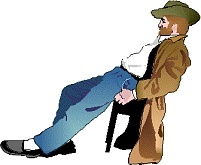 Overall the rabbi is euphoric, deciding on the spur of the moment to return the next day for the morning services. The Putti Abayudaya hold prayer services every morning and evening. There are only two pairs of tefillin for all of them. Even after an orthodox conversion, a lot still will need to be done for these wonderful people. The rabbi, in state of elation, is not oblivious to this.